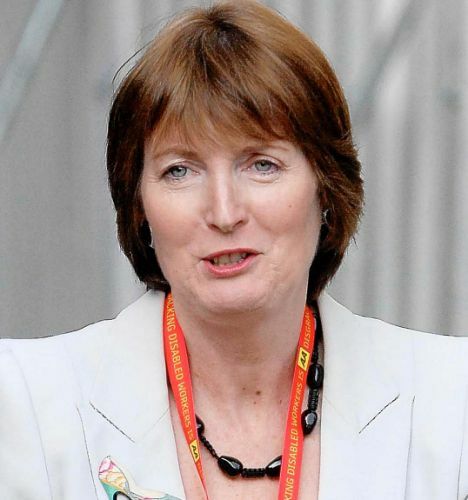 Why does Harriet Harman hate marriage? Political ideologues live in a permanent state of denial, refusing to accept any evidence that contradicts them. A classic example of this pattern lies in family policy. For decades, feminist zealots have told us that family structure is irrelevant, fathers are unnecessary for child-rearing and marriage is outdated. These views have had a disastrous influence, encouraging the state to preside over the breakdown in the traditional family. The results are everywhere - in crime, in benefits dependency, poverty and the rising costs to public services. Yet, amid all this wreckage, hardliners still cling to their dogma. And none is more hardline than the High Priestess of British Feminism, Harriet Harman. In an extraordinary interview published yesterday, she declared marriage was 'irrelevant' to public policy and described high rates of separation as a 'positive development', as it reflected 'greater choice' for couples - never mind the children. If nothing else, Harman can be credited with consistency. Neither the facts nor the passage of time have changed her mind. She was preaching this dangerous gospel of feminist fascism when she was first elected to Parliament in 1982. When I came to work for her as a parliamentary aide in the early Nineties, Harman was questioning whether fathers were necessary at all. 'Families come in all shapes and sizes', has long been one of the favourite mantras of the Left. Research, concluded that a stable background means you are less likely to be out of work, live off the State, become single parents or even smoke. Children of married parents do better in exams, according to other studies, and are less likely to have mental difficulties. The Commons Home Affairs Committee has shown that levels of family breakdown among the black community are propelling teenagers into a life of crime. This was all too evident in Peckham's phenomenal caseload, arising from an army of constituents who were reliant on the state for all their needs, which meant I found working for Harriet an extremely demanding job. When I first took up the post, many friends in the Labour party told me I was an idiot to do so. She had a tyrannical reputation, notorious for her unreasonable demands and hectoring manner. But, despite her image and the heavy workload, Harman was personally decent with me and generous with her praise. Even so, there was often an air of chaos about her management - she often struggled to remain on top of her paperwork. And for someone in the frontline of politics, Harman could be strangely ill-informed about current affairs and I would have to brief her strenuously for appearances on BBC Question Time, trying to ensure, for instance, that she remembered the names of key players in the Middle East peace process. She could also be odd about money. At one stage she decided to employ a media negotiator to enhance her earnings from routine broadcast appearances - unheard of in Whitehall. It was a tactic that backfired when an outraged ITV company leaked to the Press her substantial demand for a fee. The negotiator was no more. Regardless, for several years after I had left my job with her and embarked on a career as a writer, I retained some affection for Harriet. In 1998, when she was being attacked for her poor handling of the welfare portfolio, I even wrote an article in this paper in her defence. But over the past decade, I have become increasingly disillusioned. I can now see what aggravates so many people about her: the politically correct condescension; smug self-certainty despite a record of incompetence; the whiff of born-to-rule arrogance; the attachment to the shibboleths of multi-culturalism and feminism. Harman is the embodiment of so much that is wrong with New Labour. Born into affluent privilege herself, Harman is that classic socialist type that regards the robust British working class with suspicion. But Harriet's greatest vice - and there are many - is her hypocrisy. She is now the Deputy Leader of a party that, in its latest by-election campaign in Crewe, has descended into the gutter of class warfare, deriding its opponents as 'toffs'. Yet few figures in modern politics have enjoyed greater privilege than Harman. Her father was a Harley Street surgeon, her uncle the Earl of Longford. She was educated at the exclusive St Paul's Girls' School, before going on to York University and legal training. And like so many of the New Labour elite, she has never had a real job in the commercial world. Before she entered Parliament, she worked as the legal officer for the radical pressure group, the National Council for Civil Liberties. Further hypocrisy comes in the way she is raising her family - Harman's attachment to the socialist ideal of comprehensive education clearly does not extend to her own life. She sent one of her sons to a grant-maintained school, another to a selective grammar, reinforcing the belief that too many Labour politicians refuse to practise what they preach. Living in the leafy enclave of Dulwich, Harman's detachment from her constituents' lives was further reflected when she wore a stab-proof vest for a tour of Peckham, even though she was escorted by three police officers. The fact Harman has retained high office for so long is a tribute to her iron-clad self-confidence. In 11 years of Labour rule she has no significant achievements to her name. She was sacked from the Cabinet by Blair in 1998 for making a hash of the policy of welfare reform. Since then she has used a succession of jobs, first Solicitor-General and now Minister for Equalities and Leader of the Commons as a platform to propound her dated brand of feminism. Her mix of incompetence and cash problems was again demonstrated when she was embroiled in the Donorgate row recently, having accepted money for her Deputy Leadership bid without checking the source and then failing to make a proper declaration to the Electoral Commission, the party funding watchdog. Harman is fond of talking about equality, but her policies move in precisely theopposite direction. So she has called for the introduction of U.S.-style positive discrimination for job candidates, where female and ethnic minority candidates are favoured over white males. This is in direct contradiction of equal opportunities. Nothing could be more unjust, patronising or discriminatory than awarding jobs on the basis of skin colour or gender. The same is true of her scheme to promote all-black shortlists in elections to increase the number of non-white MPs. But then Harman has never had time for the British public, preferring to patronise rather than listen. She wants to shape society instead of serving its genuine needs. Her entire career, based on the elitist belief that she knows best, represents a betrayal of the traditional working class - the very people Labour was founded to represent.